IFTA kicks-off the first of its ‘IFTA Animation In Focus series’ with the Academy taking a closer look at three examples of recent Irish animation short films that have different styles and techniques followed by discussion and insight into their production journey from concept to international screens and audiences worldwide. The event is curated by the co-founder of Cartoon Saloon and three-time Oscar-nominee Paul Young. 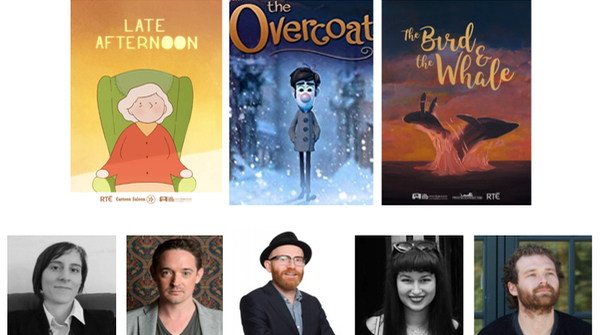 The Academy will screen three special Short Animation Films, Oscar-nominated ‘Late Afternoon’ (9 minutes), ‘The Overcoat’ (30 minutes) and ‘The Bird & The Whale’ (7 minutes). Panel Discussion - with the Creators! The Screening will be followed by a Panel Discussion and Q&A with the creators of the films; Louise Bagnall(Writer & Director, Late Afternoon, Cartoon Saloon); Hugh O’Connor(Writer, The Overcoat); Carol Freeman(Writer & Director, The Bird & The Whale); Jonathan Clarke(Producer - Giant Animation, The Overcoat and also The Bird & The Whale); Curated by Paul Young(Cartoon Saloon). Join us after to continue the discussion in the Lighthouse Bar. Produced by the Kilkenny-based animation studio behind Oscar-nominated animated features ‘The Secret of Kells’, ‘Song of the Sea’ and ‘The Breadwinner’, ‘Late Afternoon’ is a poignant examination of identity and memory loss. Emily an elderly woman, journeys into her past, reliving moments from her life and searching for connection within her fragmented memories. Written and directed by Cartoon Saloon’s Louise Bagnall, and produced by Nuria González Blanco, the hand-drawn digitally animated film was nominated for Best Short Animation at the 2019 Academy Awards. ‘Late Afternoon’ also won the IFTA Award for Best Animated Short in February 2018. Renowned Irish actress Fionnula Flanagan voices Emily, with music for the film by Colm Mac Con Iomaire. An adaptation of Nikolai Gogol’s classic tale, ‘The Overcoat’ takes the form of a bedtime story told by a grandfather to his granddaughter about a lonely office worker who saves up to buy a new coat at Christmas in an effort to make new friends, only for fate take a ghostly hand. Directed by Sean Mullen and Meelis Arulepp, from a script written by Hugh O’ Conor, the animation has a star-studded cast including Irish actors Cillian Murphy (Peaky Blinders) and Michael McElhatton (Game of Thrones). The Overcoat combines classical hand-drawn animation with modern CG animation techniques to craft a unique and heartwarming story that speaks to audiences of all ages. An oil-paint on glass animated short film, 'The Bird and the Whale' follows a baby whale separated from his family. The whale discovers a caged bird, the sole survivor of a shipwreck. The two develop an unlikely friendship as they struggle to survive together, lost at sea. ‘The Bird & The Whale’ is written and directed by Carol Freeman with animation from Eimhin McNamara and Santiago Lopez Jover. Jonathan Clarke of Giant Animation also produces the short animation with an original score by Chris McLoughlin.